They offer a restful night’s sleep in a forest canopy, an early morning breakfast of juicy caterpillars and a cool, fresh drink from a stream or wetland. Ontario Nature’s 21 reserves – more than 2,000 hectares of protected land across southern and eastern Ontario – provide much-needed pit stops and even nesting habitat for millions of migratory birds that travel between tropical winter homes and their summer nesting grounds in Ontario. Ontario Nature began protecting land in 1961, when it acquired the Dorcas Bay Nature Reserve on the Bruce Peninsula. Since then, Ontario Nature has been steadily building its system of nature reserves through purchases, donations and bequests of ecologically significant lands. Some nature reserves serve as important stepping stones – pockets of forest cover within urban and agricultural areas and even on islands in the Great Lakes. Stone Road Alvar on Pelee Island, Willoughby Reserve in Caledon, Cawthra Mulock Reserve in King Township and Lawson Reserve south of Ingersoll are all critical stopovers and offer birders in southern Ontario an opportunity to view boreal birds during migration. Many warblers – including the palm, Tennessee, bay-breasted, Canada and blackpoll – will spend a night recharging in these forest canopies before continuing northward to Ontario’s vast boreal forest. The best time to see such birds is in early spring, just as deciduous trees are beginning to leaf. Still other migratory birds make nature reserves their destination. The black-throated blue warbler, ovenbird, blue-headed vireo and scarlet tanager all nest in Ontario Nature’s reserves. Ontario Nature’s larger reserves – Altberg Wildlife Sanctuary in the City of Kawartha Lakes (471 hectares), Kinghurst Forest in Grey County (280 hectares), Lyal Island in Lake Huron (305 hectares) and Quarry Bay on Manitoulin Island (391 hectares) – offer these birds large tracts of unfragmented, interior forest habitat. The black-throated blue warbler’s recent recovery in southern Ontario underscores the importance of protecting and restoring such intact forested areas. By the late 1900s, after widespread clearing of, mature tracts of deciduous forests for agriculture and urban development, the black-throated blue warbler was almost completely absent as a breeding bird south of the Canadian Shield and Bruce Peninsula. Recent data indicate, however, that the warbler is once again nesting in southern Ontario, along the Niagara Escarpment and the Oak Ridges Moraine, and in other areas with intact forest. 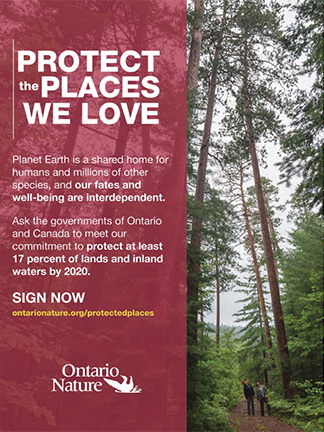 To that end, Ontario Nature is seeking to add more land to its existing reserves and establish new ones that protect imperilled and vulnerable habitats in Ontario. All the reserves are open to the public. 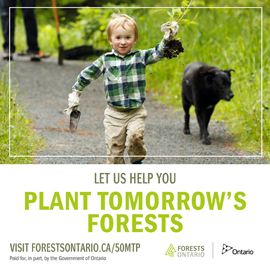 Click to learn more about Ontario Nature’s reserves. Reduce fuel consumption. The Alberta tar sands are a few of many petroleum-extraction projects that are responsible for large-scale habitat destruction. According to a report by the Natural Resources Defense Council, the Boreal Songbird Initiative and the Pembina Institute, these projects could be responsible for the deaths of 160 million birds over the next few decades. By reducing our fuel consumption, we reduce the demand for oil from tar sands. Buy organic. Many of the fruits and vegetables found in a typical grocery store are grown using harmful pesticides, which are bad for us and bad for birds. Look for organic food options; many are produced locally, so eating organic can also mean reducing fuel consumption. Buy shade-grown coffee. Most mass-produced coffee is grown in sun-drenched fields – often the result of extensive clearcutting – and heavily treated with fertilizers and pesticides. Shade-grown coffee operations provide healthy canopies for birds, often in areas where there is little forest cover. Use Forest Stewardship Council (FSC) certified paper products. While reducing the use of paper products is the most effective way to prevent logging boreal habitat, FSC certification is proof that lumber is logged in a responsible and sustainable manner. Mark Carabetta is Ontario Nature’s Conservation Science Manager.